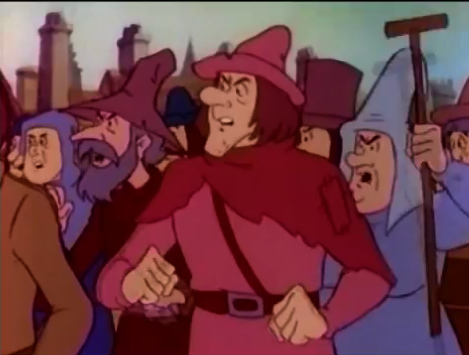 The 1986 Australian version of the Hunchback of Notre Dame is in so many, many ways like the 1956 version. It follows the book plot almost perfectly but the execution on every other aspects of this movie is bad, like the 1956 version . This version does changes a lot of things especially at the end. Spoiler warning Esmeralda lives. 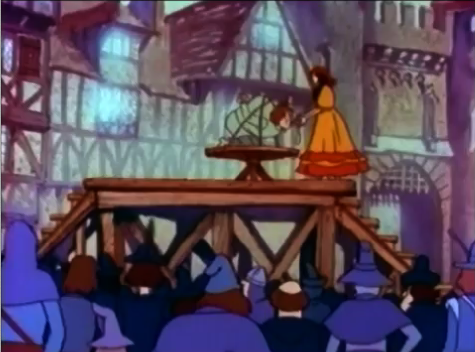 At the climax the crowd attacks the cathedral and demands Esmeralda’s death, so the court of miracles doesn’t try to save Esmeralda and sanctuary is not suspended. 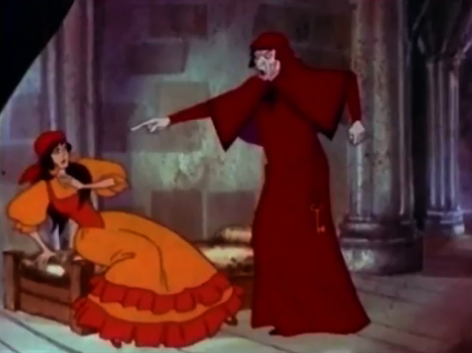 Quasimodo fights them off as well as kill Frollo. 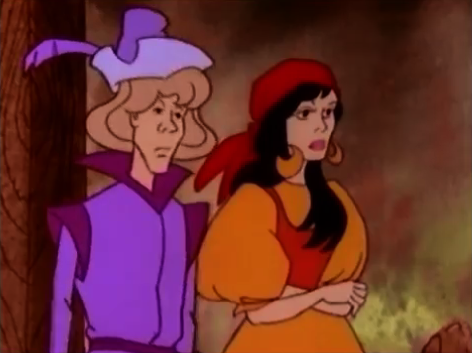 As the crowd demands Esmeralda, Phoebus appears and tell everyone the true, that Frollo is a frowny-pants, he was never and dead and Esmeralda’s only crime was being pretty. 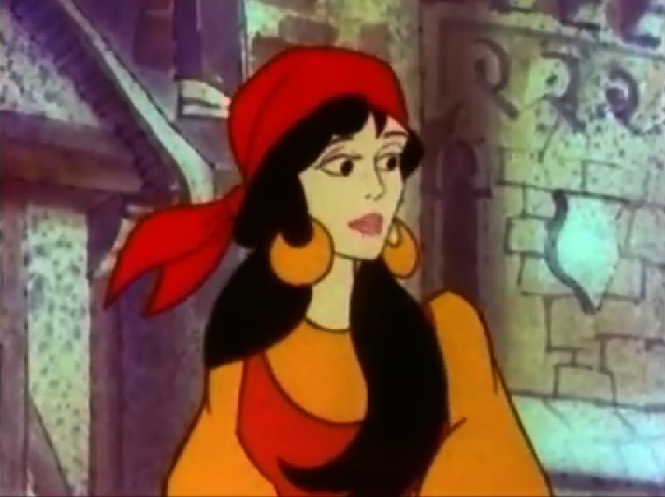 Esmeralda ends the movie by saying that Quasimodo is is beautiful and innocent. I have seen worst endings but I have to wonder why Phoebus didn’t say anything earlier. 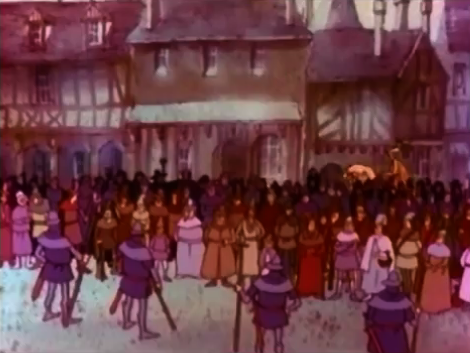 When Esmeralda is about to be burned at the stake, not sure why they change this since they mention hanging, Phoebus is seen walking through the crowd. It just seems so weird for him not to say anything at that point but then he does later. This version hits the plot notes of the book but it does it in a mechanical way. It’s like they have things happen for no reason than the book say it must, like there is not reason why the mob attacks Notre Dame the just do it. There is no fluidity or joy to the story telling. It’s almost as through the filmmakers felt that if they got the majors plots point right they could skip on other things, like character development or emotion. The Plot adherence is this version only viable strength they tweaked some things and made weird decision but no version is all faithful. And if this version had a better script, animation, design, music, etc it could have been much stronger. Next Time- I guess I should talk about the characters next…….? There is not much to them though. 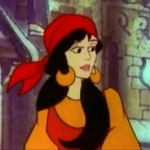 I guess we’ll start with Esmeralda.